Maryland is a state of the east-central United States. It was admitted as one of the original Thirteen Colonies in 1788. 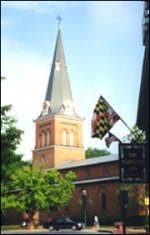 The colony was founded by Lord Baltimore in 1634 as a refuge for English Roman Catholics. Annapolis is the capital and Baltimore the largest city. Population: 5,600,000. Maryland was inhabited by Indians as early as circa 10,000 B.C. Permanent Indian villages were established by circa A.D. 1000.The Paleo-Indians who came more than 10,000 years ago from other parts of North America to hunt mammoth, great bison and caribou. By 1,000 B.C., Maryland had more than 8,000 Native Americans in about 40 different tribes. Most of them spoke Algonquian languages. They grew corn, peas, squash and tobacco. They also hunted, fished and traded with tribes as far away as New York and Ohio. Giovanni da Verrazano, an Italian explorer in the 1500s, was the first European to visit the Chesapeake. Later came English settlers, who left England for more economic opportunities and to escape religious oppression. In 1608, Capt. John Smith explored Chesapeake Bay.Fur trader William Claiborne thought so, too, and set up a fur trading post on Kent Island in 1631. This was the first English settlement in the upper Chesapeake. Maryland began as a colony when King Charles I promised George Calvert, the first Lord Baltimore, a colony north of Virginia. Before he could visit the colony, George Calvert died. His son, Cecilius, became the second Lord Baltimore and the Lord Proprietor of Maryland. He named his colony "Terra Maria," or "Maryland" in honor of the king's wife, Queen Henrietta Maria. Because Cecilius Calvert had to remain in England, he sent his younger brother, Leonard, to accompany the colonists and to be the first governor. Colonists set sail on November 22, 1633 on the ships Ark and Dove. The four month's voyage carried between 200 and 300 passengers. The leader of the colonists and first Governor of Maryland was the brother of Cecil, Leonard Calvert. In 1694, when the capital was moved from St. Mary's to Annapolis, those were the only towns in the province, but the next century saw the emergence of commercially oriented Baltimore, which by 1800 had a population of more than 30,000 and a flourishing coastal trade. Tobacco became the basis of the economy by 1730. In 1767 the demarcation of the Mason-Dixon Line ended a long-standing boundary dispute with Pennsylvania. Trade restrictions and high taxes led to the Revolutionary War in 1775. Marylanders opposed the Stamp Act, protested the Boston Port Bill by burning a boat and the tea cargo, and attended the First Continental Congress in 1774 in Philadelphia. Baltimore served as the country's capital until after the war when it was moved to Annapolis. In 1788, the United States Constitution was signed. Maryland became the 7th state to join the new country, with Annapolis as the state capital. In 1791, Washington D.C. was created from land donated by Maryland, and became the nation's permanent capital. The Civil War began in 1861. Although many plantation owners in Maryland fought with the Confederacy, Maryland's legislature sided with the United States and adopted a new constitution that ended slavery. Again, many battles were fought on Maryland soil. With the end of the Civil War, industry quickly revived and became a dominant force in Maryland, both economically and politically. Senator Arthur P. Gorman, a Democrat and the president of the Baltimore & Ohio Railroad, ran the controlling political machine from 1869 to 1895, when two-party government was restored. New railroad lines traversed the state, making it more than ever a crossing point between North and South. Labor troubles hit Maryland with the Panic of 1873, and four years later railroad wage disputes resulted in large-scale rioting in Cumberland and Baltimore. During the 20th cent., however, Maryland became a leader in labor and other reform legislation. The administrations of governors Austin L. Crowthers (1908–12) and Albert C. Ritchie (1920–35) were noted for reform. Ritchie, a Democrat, became nationally known for his efforts to improve the efficiency and economy of state government. In 1919, Congress passed the prohibition law, prohibiting the manufacturing, selling and transporting of alcoholic beverages. Maryland opposed the law, because it violated their state's rights. Because of this, they were known as the Free State. After World War II, Maryland improved its transportation systems. BWI Airport opened and many bridges, tunnels, and highways were built. When the Supreme Court ruled segregation in schools as unconstitutional in 1954, Maryland changed the fastest of all the southern states by integrating schools and neighborhoods. Several school systems were expanded. In 1985, Maryland began a government project to clean up the waste from cities and factories flowing into Chesapeake Bay. The waste was killing many of the fish and shellfish living there. Since then, millions of oysters have been placed in the bay.